Tonight’s Dinner Idea is Baked Ziti. This recipe makes a lot, so you may be able to freeze half of it for another meal. Serve with a simple green salad. Need a little inspiration? Check out my Recipe Box which is updated daily with new recipes! Wondering what to make for dinner tonight? You’ll love my money-saving recipes on what to cook for dinner! 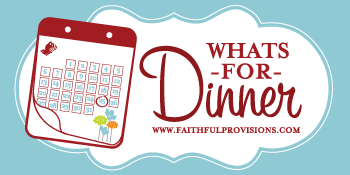 You are encouraged to not only list your dinner plans, but to request ideas and add your favorite recipes!